I came across this youngster in Allegany State Park the end of June. Never did see an adult bird and I hope things worked out okay for it. 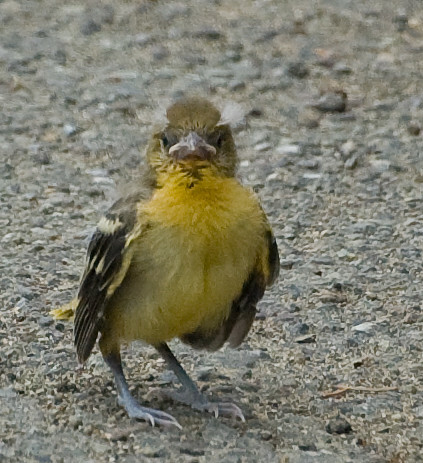 I believe it is a juvenile Baltimore Oriole. This entry was posted on 25 August 2011 by patacoate. It was filed under iPhone and was tagged with Allegany State Park, Baltimore Oriole Juvenile. 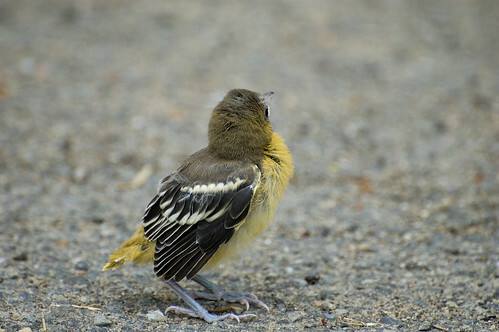 This looks quite like the goldfinch fledgling I watched in my yard. I know mine was a goldfinch because I saw both the mother and father bird tending to the baby. I didn’t get as close as your photograph though. Thanks for visiting mon@rch’s nature blog. 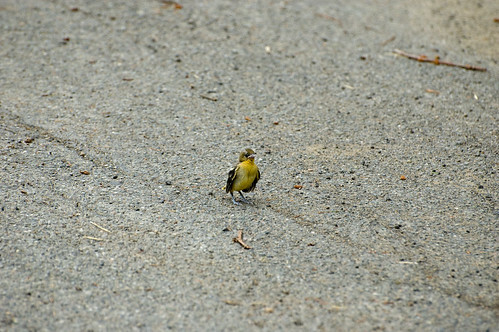 My first thought also was that this bird might be a goldfinch. When I compared these photos to some google images, the goldfinch fledglings shown there seemed to show more black on the wings, more yellow and other differences in the eye region, and different coloring of the feet. 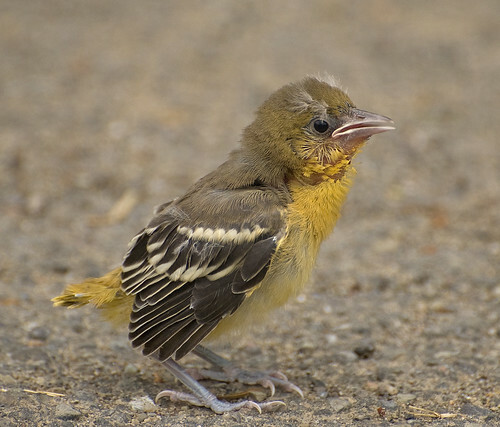 So I consulted a couple local experts who each ID’ed it as a Baltimore oriole fledgling. I sure hope it survived and returns to give Tom a chance to catch and band it next year! Just too cute. Bet you just wanted to scoop it right up and make things right. Don’t you just love birds? I’m worried about them with this hurricane. What a cute little bird, did you ever go back and see what happened to the little thing? I found a baby yellow vented bulbul in some ferns one day and upon futher inspection realised that its nest had been raided (possibly by crows) and its sibling was dead. I raised the bird and then released him back into the wild.